Who unfurled a sign reading “Kill Angela Merkel” at the designer’s show. WTF. Another Rick Owens show, another headline. This time, a male model who goes by Jera used Owens' Spring '16 runway to air his political views. As he walked, Jera unfurled a banner reading "Please Kill Angela Merkel — Not." WWD reports Owens was furious, and is quoted as saying, “It’s a crazy, rogue, f***ing model that I punched when he came back out. 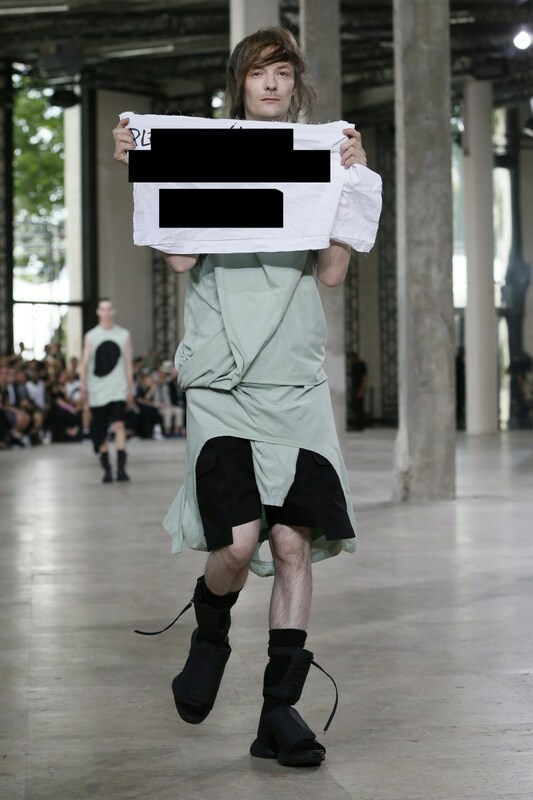 Please say that I punched him.” The Owens camp has asked that any reports on the incident use a photograph with the political missive blurred out—it "does not reflect the opinion of the house of Rick Owens."